You had undertaken Odarpu Yatra in 2013 and Rythu Bharosa Yatra in 2017. How different is Praja Sankalpa Yatra from those earlier ones? The interaction [then] was not as intense [as it has been in the case of] Praja Sankalpa Yatra. In this padyatra, people know where you are sleeping. Since they know where you are, everybody is aware of the route we are going to take. Since we travel on foot, there is a lot of time for interactions. It is about connecting with the people. My sheer affection [for the people] is the only force that has led me to walk this distance. We have crossed 2,500km, the distance between Hyderabad and Dubai. What are the issues that moved you while interacting with the people? As the leader of the opposition, I am aware of the problems. But, during the yatra, we get to know the minutest of details. Farmers are complaining of not getting remunerative prices. The reason is that Chief Minister Chandrababu Naidu has Heritage supermarkets across the state. The CM is supposed to curtail the brokers, [who] procure [commodities] from farmers at cheap rates, and then repackage and sell them at three or four times the price. Galla Foods and Srini Foods, whose owners are Telugu Desam Party leaders, are also procuring [commodities] from farmers. Also, Naidu has not completely waived off farm loans, as he had promised to do in the previous election. The fee reimbursement scheme for students and the Aarogyasri scheme, which the entire country had looked up to, have become a farce…. Corruption is rampant and the sand mafia is thriving. The yatra will end in two months, while the elections are due only in May next year. Do you think you can sustain the impact till then? It is not about the elections. In 2003, dad (former chief minister Y.S. 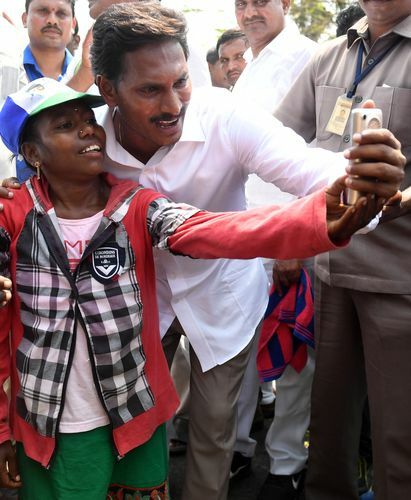 Rajasekhara Reddy) finished his padyatra in June, and the elections were held in May 2004. Once people take you to their hearts, thinking that here is a leader who has come this far to see our plight, it does not matter how many days are left for the elections. Let us talk about Amaravati. You have been alleging that the capital was not planned properly and that various scams have taken place. Where did the TDP government go wrong? Any dumb chief minister can build a secretariat, a high court and an assembly in four years. It has been more than four years, but this man has not laid even one permanent brick. No chief minister has been this worse; can never be this worse. First of all, his opting for that location was a scam. He knew exactly where the capital was going to come up, and he and his middlemen bought land from farmers at cheap prices. After that, he declared the capital as Amaravati. Then he ensured that the land his middlemen bought were not acquired by the government. The scam did not stop there. After forcible acquisitions, which he called land pooling, the entire region was under section 124 [of the Indian Penal Code, which deals with sedition]. If the YSR Congress comes to power in 2019, will there be an inquiry into the Amaravati project? You will have to show the people what the reality is. What was done, and what actually could have been done. So, definitely, an inquiry has to be made and the details will have to be made public. More than two dozen MLA and MPs have quit the YSR Congress to join the TDP in the past four years. Will this have any impact on the distribution of tickets this time? Do you think you committed a mistake in selecting candidates? No, it was not a mistake. How can anyone resist Rs 20 crore or Rs 30 crore? I did not expect these MLAs to resist that. Only 23 of 67 MLAs left, and I salute the rest of them who chose to stay, even though they were offered similar amounts. Moreover, they were given an assurance that they would not be disqualified as the speaker is their person. You take 23 people, and don’t have the guts to go for elections. You don’t disqualify them, though the rules say you should do so. You make four of them ministers. This is the height of mockery. You have been criticised for boycotting the assembly and taking the fight to the streets. For three and a half years, I repeatedly requested the speaker to disqualify legislators [who joined the TDP from the YSR Congress], yet no action was taken. Had we attended the assembly after that, it would have looked like we were okay with our MLAs being poached. Will you have a pre-poll alliance with any party? There is no point in having an alliance with any party, because people of Andhra Pradesh are sick and tired of these alliances. Everybody takes us for a ride. What is the point in aligning with the Congress? They could have put provisions for granting the special category status in the [Andhra Pradesh Reorganisation] Act, but they did not do it. Everything in the act is mentioned as ‘may’ instead of ‘shall’. 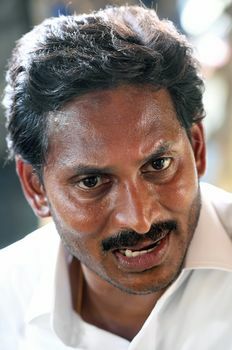 Now this party comes to us, and says we are going to get special category status to Andhra Pradesh. We are not going to have an alliance with any party, but will support any party after they give special category status. As far as the BJP is concerned, why have an alliance with them? They are also party to this cheating. On the floor of the house, the BJP had accepted to give special category status to Andhra Pradesh. They had it in the manifesto as well. What do you have to say about a third front—of regional parties coming together as an alternative to the Congress and the BJP. For us, Andhra Pradesh is of primary concern. We have no specific interest in any party or front. Anybody who is willing to give special category status to Andhra Pradesh, and anybody who is capable of forming the government—at that stage, we will support them.